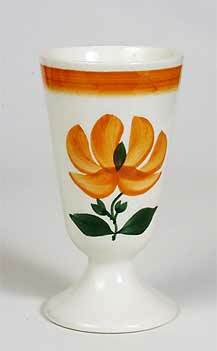 Gien goblet - 5¼" (133 mm) high. The Gien factory was founded by Thomas Hulm near Orleans, France, in 1821. The company is famous for its faience in Rouen and Italian styles. In the early 1980s the company faced financial difficulties, and has since been known as Societe Nouvelle des Faienceries de Gien.